Looking at another treasure in large amount of papers I inherited from my Grandmother was this item. A programme for military exercises a few months prior to the start of World War Two. I knew my Grandfather and Great-Grandfather were in the26th Battalion in the mid-1930s but having this gives more evidence that one of them was still there in the 26th in the late 1930s. So I thought I’d go hunting in our favourite place for further information Trove and this is just one of the articles I found. I am hoping that someone may be able to identify the uniforms/badges in this photo. Is this possibly around 1930’s? 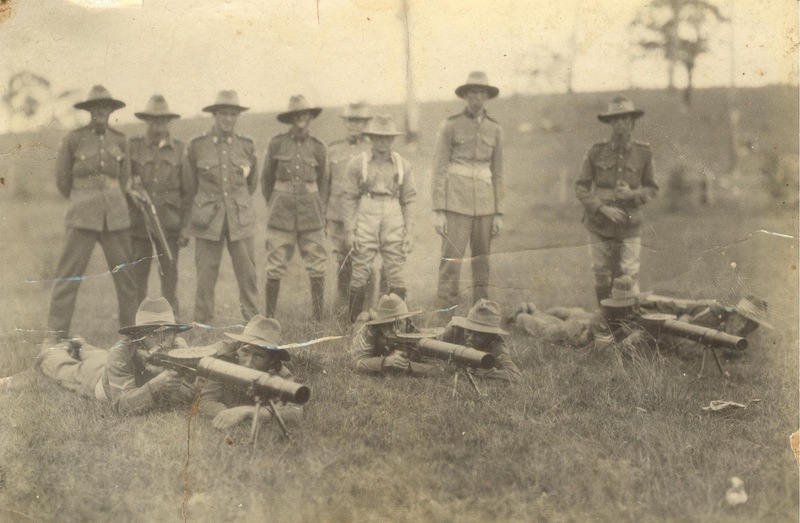 Possibly 26th Battalion? 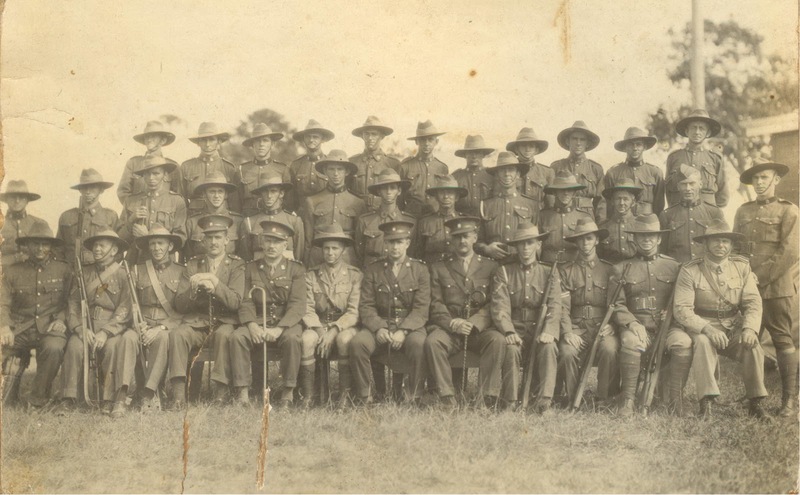 I believe it may possibly be a photo of the 26th Battalion which George joined in 1930 and re-engaged in 1933 Militia record at National Archive. I base the probability of this date simply on the number of men who appear to be wearing service ribbons and their approximate age. This photo was found in a box of treasures among George’s possessions that I inherited from my grandmother along with the below photo. Both have the same backing and look as though they were taken at the same time. I am hoping that some knowledgeable person may be able to enlighten me further about possible dates for these photos. George Howard Busby was born in Brisbane in 1884 to William and Anne, George grew up around Toowong where his father was a monumental mason. He married Nora Courtenay and had three children. George enlisted 29 September 1914, eight weeks after war was declared, into the 15th Battalion 4th Infantry Brigade at the Exhibition Grounds Brisbane. The personal details in his enlistment papers (available online at the National Archives) were fantastic: 5 foot 7, fair complexion and grey eyes. Under distinctive marks: on left arm tattoo fireman’s helmet and two crossed axes (which clue led to more research) and a bullet wound (scar) over left knee (not what I was expecting). There is still more to be found out about his previous military service. George was wounded at Gallipoli and was sent to Edgbaston Hospital in Birmingham then to Epsom then to Courtauld’s Hospital in Coventry before coming home to be discharged. he then spent the rest of the war as a recruiting sergeant.